Easter morning….it was such an exciting time at the Lassalle house. Some time during the night, the Easter Bunny visited. How he got all those treats hidden in such a small house without five kids seeing him, I will never know. Usually, my Dad had to work on Easter. He worked graveyard and didn’t get home until 9:30 in the morning. We never waited for him because he often pulled a double shift on Easter. There were always several people on the bread line at Safeway who found themselves too ill to work on Easter morning. The minute the last kid woke up we started. We had to scour the house for our bounty. Eggs, peeps, chocolate candy could be found anywhere. There was also a special basket hidden for each of us. What’s funny is although our house was small, there were always a few chocolate eggs that got missed. I remember one year something was in the way of the pedal of the organ. I reached underneath and found a chocolate egg. That was 6 months after Easter. This is us ca 1966-1967 after our hunt. All smiles before getting sugared up. 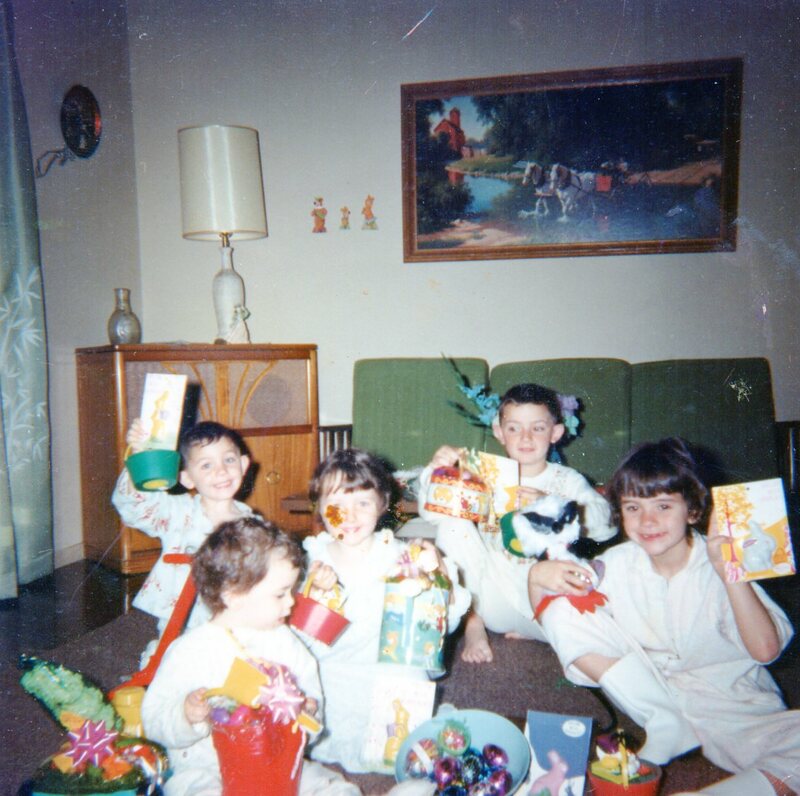 I’m the youngest in the front with the red basket checking out what everyone else got. In addition to our baskets and assorted goodies, my mom always picked up a big chocolate egg for each of us. They had our names on them so no one (that means you, older brother) would steal it. I remember savoring it all week. If we were lucky, she bought the solid eggs. But, those were expensive. One year we got those sugary hand decorated diorama eggs. You know, the kind with the scene inside. I remember my best friend got one every year and I was thrilled when my Mom got them for us one year. Though we gave up the egg hunt by the time I was in 3rd grade, my Mom still bought us treats well into our teens. In between all of this my Mom cooked a lavish Easter dinner–by herself. We always had sit down dinners but Sunday was the day my Mom was able to cook a big meal. Sometimes our grandparents were be there. Other times it was just us. Almost always we waited as long as we could for my Dad to get home, then finally, my Mom gave in as everyone was hungry. There was one year he didn’t make it home from work until 8pm, his dinner cold in the fridge. Happy Easter to all who celebrate! May your celebrations be filled with festivity and laughter.